The slaughter was enabled by our own elected politicians, with an assist from the Supreme Court. 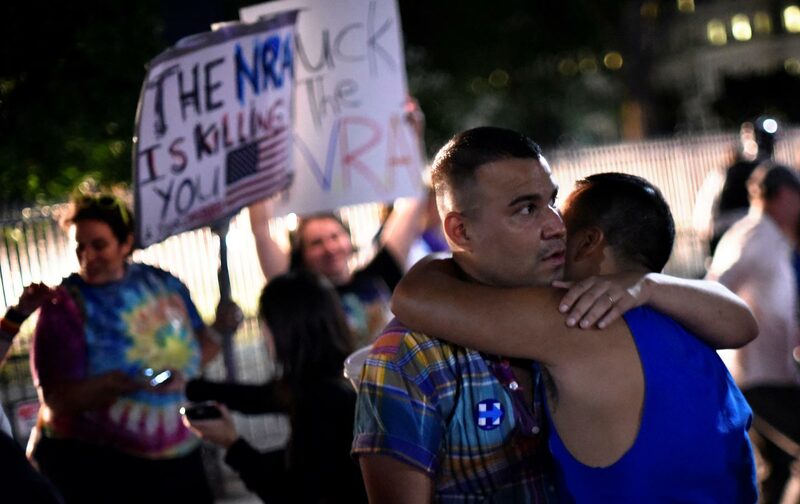 Our grieving over the Orlando massacre will have little or no effect unless we mobilize our sorrows into rage that targets all of the political culprits. Americans must mobilize a take-no-prisoners political anger that overrides the usual lamentations and legalistic excuses from politicians in both parties. Don’t just blame crazed bigots or foreign subversives. This slaughter was enabled by our own elected politicians, with an assist from the US Supreme Court. They should be the true target of our rage. This is the dreadful reality that has led our country to its continuing sorrows. The government has failed to protect citizens from the random violence that is fast becoming a blood-soaked ritual. Politics has failed at every level—federal, state, and local—and then politicians plead that they are helpless to prevent the slaughter. People must not accept that legalistic dodge. If the United States can bomb other nations without a declaration of war, the United States can confiscate the high-powered military weapons that are routinely sold to the random madmen who are driven to violence by their own hateful political delusions. If Washington will not halt the domestic violence, citizens will feel compelled to take up their own self-defense. We the people are confronted by a profound crisis of national security far more threatening than any of the far-flung wars the United States has engaged in the Middle East. I predict that if Washington will not act forcefully to halt the domestic violence, endangered citizens will feel compelled to take up their own self-defense. The violence is a constitutional emergency subverting the civil order—a crisis the Supreme Court did not anticipate when it threw out the gun-control laws and rewrote the Second Amendment. Chief Justice John Roberts has blood on his hands. So do his right-wing associates who defended the “gun rights” trumpeted by the National Rifle Association. If my accusation seems unfair, tell it to the scores of families whose innocents were murdered without a trial. There will be many more of these victims—you can count on it—so long as the Supreme Court puts guns beyond the reach of law. The country might have been on the way to a solution for this dilemma except for the unconstitutional intervention of Senator Mitch McConnell, the Republican Senate majority leader. With the death Justice Antonin Scalia, President Obama had the power to appoint a more liberal replacement, except McConnell preemptively announced that his GOP majority would refuse to consider anyone Obama nominated. Let’s be blunt about this. McConnell has made a minstrel show out of the Constitution. Any lame-duck president in the final year of his term has the power to appoint a new Supreme Court justice—unless, it seems, that lame-duck president has a black face. Can anyone doubt that race was an important factor in the GOP’s refusal to even consider Obama’s nominee? Can we imagine a GOP Senate refusing to consider a nomination from a white Democratic president? Indeed, after Obama nominated a greatly respected (white) judge, Dems poured on criticism after the GOP refused to act. But it was telling that Democrats were too polite to accuse McConnell of racist intent; instead, he became constitutional scholar for a day. Democrats should have shut down the Senate until he respected regular order. That would have doubtless produced the gun-law reforms the nation so desperately needs. My complaint against Senate Democrats is that they have been too polite to accuse the GOP leader of racist intentions. They should do so now. Let him deny it. Let other Republican senators run for cover. Because Orlando has made clear that this is indeed a great crisis in homeland security that cannot tolerate political game-playing. The bloodbath in Orlando should profoundly alter the popular impatience with political game-playing. In fact, the bloodbath in Orlando should profoundly alter the popular impatience with political game-playing. If Democrats wish to overcome the popular skepticism toward them, they will go to the barricades and stymie whatever legislative action the McConnell crowd attempts in the next few months unless the GOP abandons the gun nuts and accepts rigorous new gun laws. Don’t hold your breath. The NRA is powerful because a generation ago it targeted and defeated a handful of congressional members who did not vote its way. Once blindsided, the pols fell in line. If the Democratic Party is unwilling to make this fight, then popular anger must make it for them. Pick a handful of Dems and Republicans who vote wrong on guns and take them out. That message will destroy the NRA’s political monopoly. Americans at large have “gun rights” too—the right not to be slaughtered by deranged marauders with 100 rounds of deadly force. Whatever the politicians decide, this crisis also demands direct action that confronts disgusting contradictions the elected politicians have usually tolerated. Who sold the guns to the Orlando murderer? People should find the store and shut it down. The local prosecutor could name the owner as an unindicted co-conspirator; such a move would make gun-store owners vulnerable to civil-damage lawsuits by families of victims. And who made the guns that killed the innocents? Surround the factory too. Find out where the executives live. And who elected the guys who enacted the laws that armed the sick deviants who killed so many people Saturday night in Orlando? Do not wait for political leaders to find their strategy. Put them face to face with their failure.